News Get Peace of Mind AND a Free T-Mobile SyncUP DRIVE This Season! Bellevue, Washington — December 3, 2018 — Give the gift of peace of mind this season. Starting Friday, December 7, get a T-Mobile SyncUP DRIVE free via bill credits from the Un-carrier when you add service! 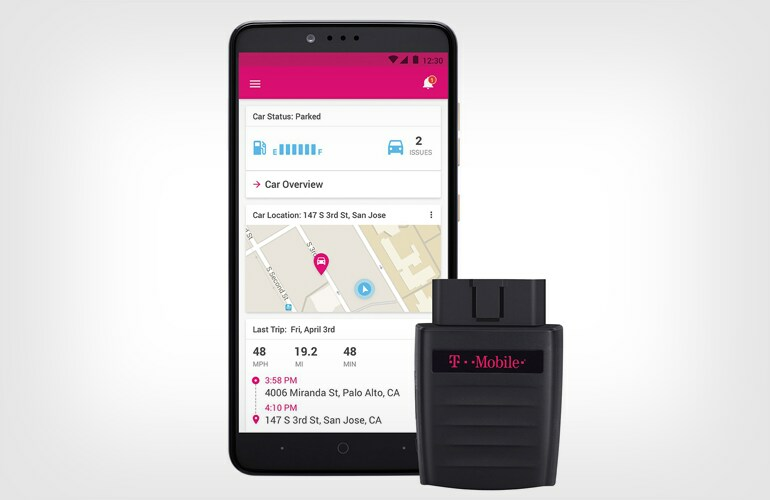 The all-in-one connected car solution easily transforms your car into a rolling Wi-Fi hotspot and bolsters safety with 24/7 roadside assistance from Allstate® Motor Club, vehicle tracking, car maintenance alerts and loads of other safety and security features. Setup is simple — SyncUP DRIVE plugs in to your car’s OBD-II (on-board diagnostics) port — standard on most cars built after 1996. And, it’s always on, so you won’t need to charge it. And you can manage your SyncUp DRIVE with an app on your smartphone or tablet. The app also helps you locate your vehicle — a particularly handy feature for that holiday shopping ‘where’d I park?’ moment. You can even set speed alerts in the app and keep tabs on your kids’ driving behavior. SyncUp DRIVE comes with Roadside Assistance from Allstate® Motor Club at no extra cost. That’s 24/7 assistance for lockouts, jumps, tire changes, tows and more, giving you peace of mind during those wintery treks and beyond. And, SyncUP DRIVE even gives you maintenance reminders, recall info, car trouble alerts and more. To get your free device (via monthly bill credits), activate a new SyncUP DRIVE plan and purchase your SyncUP DRIVE on T-Mobile’s no-interest Equipment Installment Plan. This sweet deal is available in T-Mobile stores nationwide for a limited time. All new and existing T-Mobile customers are eligible for this offer. For more details, visit: https://www.t-mobile.com/offers/syncup. Limited time offer; subject to change. Tax on pre-credit price due at sale. $0 down + $3/mo x 24 mos. pre-credit price: $72. 0% APR. If you cancel wireless service, remaining balance at full price is due. For well-qualified customers. Qualifying credit, service, finance agreement, and $25 SIM starter kit required. Must be active and in good standing to receive credits; allow 2 bill cycles. Compatible vehicle, capable device and App required for some features. Roadside Assistance provided by Allstate Motor Club. Allstate terms apply. Contact Allstate or visit here for details.